ALYSON STOAKLEY: Orange the color of the year? Orange the color of the year? I remember as a child moving to a home that was new to us but very dated for the time in decor. Everything was orange and gold and my mom despised it. Quickly, we worked to remove the orange. Turns out in 2012....orange is making a comeback! 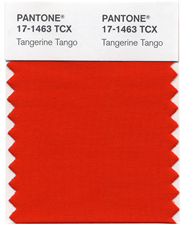 The Pantone Color Institute reports that Tangerine Tango is 2012's color of the year. Don't run out and paint all the rooms in your home orange. Pops of orange such as throw pillows,blankets and vases would work to brighten up a room. Read more here.